Psychotherapeutic services are part of best practice for psychosis treatment. To date, with the exception of cognitive remediation, no treatments (including medications) address the neurocognitive impairments that are core features of psychotic disorder and the best predictor of community function and disability. Cognitive remediation approaches have evolved from a passive brain training experience to a true psychotherapeutic experience, resulting in larger and more durable improvements in functioning. 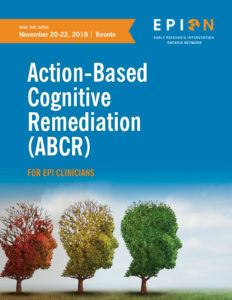 The approach proposed here, Action-Based Cognitive Remediation (ABCR), uniquely combines principles of cognitive-behavioural therapies with cognitive training.